Sleeping, playing and cartoon watching are the things that combine to make childhood amazing for the kids. They love watching cartoons on the TV. Cartoons are the best friends of all kids. Watching people dress up like their favorite cartoon characters or dressing up like one themselves excites them to the core. It would be a great idea to gift cartoon costumes for kids to the little ones as a surprise and make them wear them on various occasions like birthdays and theme parties. Out of the various cartoon characters the Looney Tunes are the most widely and appreciated ones by all kids. You can get your kid ready for the party in a manner he would love to. 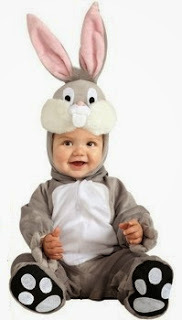 Get Looney Tunes costumes for your kid and get to see a big smile on his shiny little face. You can pick out of the various clothing options that are available with us. Some of the amazing Looney tunes baby clothes are mentioned here. All these costumes are soft in fabric that would be comfortable for your kid and are officially licensed costumes. If you or your kid is fond of Bugs Bunny, then this Bugs Bunny Halloween costume would be an ideal one for you. Your kid would definitely stand out of all the kids in the party when he wears this adorable outfit. Daffy Duck, the closest friend of Bugs Bunny might also be the best friend of your little kid. 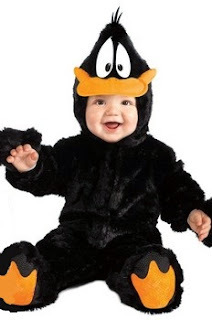 If it is, then he would just love the Daffy Duck costume that is available with us. All the kids love watching the catch race between Sylvester and Tweety. Make your kid look like Sylvester, the wild and crazy cat, if he is equally quick and witty. 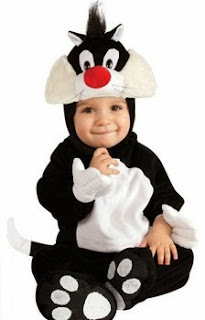 This Sylvester costume would be just so perfect for your little one. The anger, passion, spinning and biting characteristics of his personality have made Tasmanian devil, widely known as Taz, a favorite among all the kids. 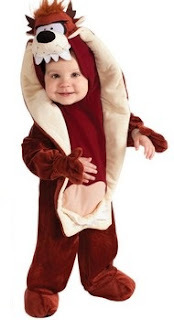 Get this Taz costume for your kid today and see your baby Taz happy and smiling. Make your baby look as sweet, cute and innocent as Tweety. With big eye lashes and high pitch voice, it ran through the hearts of kids while being chased by Sylvester. 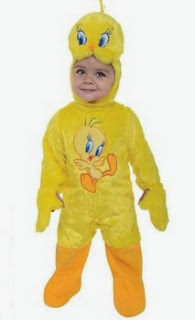 Your child would love to dress up in this Tweety bird costume. The baby Looney Tunes clothing would not only make your kid stand out in the party, but would also be a reason for the big smile on his face. Picking out of Bugs Bunny, Daffy Duck, Sylvester, Taz and Tweety baby clothes is your choice. You may also want to turn it into a theme party. You would be assisted by Looney Tunes party supplies, accessories,decorations and party favors . Get on with the fun on the party!